Mia and Clancy took the stage together. 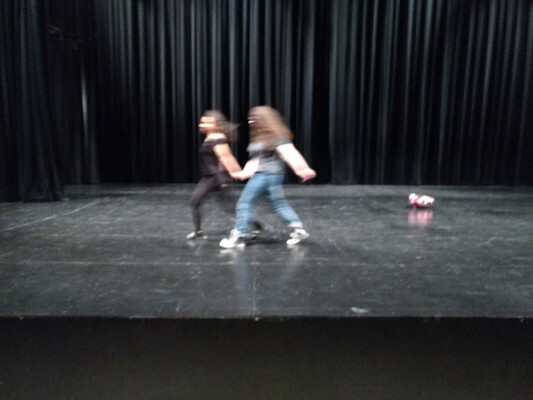 As they sashayed across, they paused at the imaginary microphone to say… “Airplane food, don’t you know?” These two high school sophomores – let me rephrase that – these two artists, were practicing their stage manners in preparation for their art world debut. Five artists will represent Territory at “Imagine This: A Safe City For Youth” hosted by the Teen Creative Agency at the Museum of Contemporary Art on Friday May 18, 6-8 pm. Our team will step up and talk about Walk In Our Shoes, a youth-empowerment walking tour that features public sites in Chicago where young people go to be themselves, to play, to share, to cry, to socialize, or just to chill. In April 2017 the team led the first iteration of this tour in Chicago’s Albany Park neighborhood for an audience attending a national art conference, Open Engagement: Justice. A year later, they are meeting with community members in Austin and have a project underway in Uptown. The team’s goal: to find and mark spaces across the city where young people have stories to tell, and to share those stories using old-fashioned and modern wayfinding tools: public art, signage, interactive activities, and apps. How Does Territory Step Back, And Let Young People Lead? This is our mandate, straight from the souls of Chicago high school students. We adults step back by building a network of people who want to invest in young people, ranging from aldermen to art teachers. We develop partnerships with civic, economic, and social agencies, find the money, and create a safe studio environment where team members come to build and hone their civic engagement and design practice skills. Our current team is showing us how it’s done. Sitting on the stage with MCA Manager of Youth and Family Programs Grace Needlman, the team slowly pieces together their accomplishments. I am the design team facilitator. Aside from a friendly prompt, I didn’t need to say anything. Grace glanced at the team, “You just said teenagers are creating safe places to gather in public, where people can hear their stories. You might not know what a big deal that is. That’s art.” Or something like that. And then, not five minutes later, four teenagers, four artists, were striding up to the imaginary microphone to test their stage voices. We hope you can come on Friday May 18, and hear from young people across the city, including Territory. It’s FREE, but registration is required. Seeking Design Studio Instructors – Are You Ready To Work With Teens?